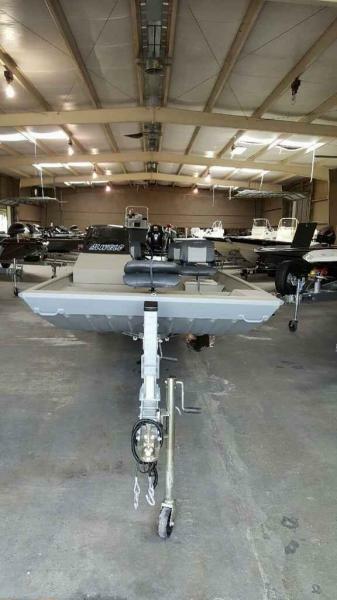 Looking to install some custom light housings on the front of my boat but I don't want anything on the top surface that would get in my way. I'm wanting them installed on the front of the boat perhaps in an aluminum housing of some kind...maybe with a grill over the surface of the light. Probably install an LED light bar in the center, and two separate lights on either side. Probably a combination of a flood light and a spot light. Anyone done something similar who can post pics for me to help me plan this out? This is an 18-56 Alweld Flat bottom. The front is square...no VEE. 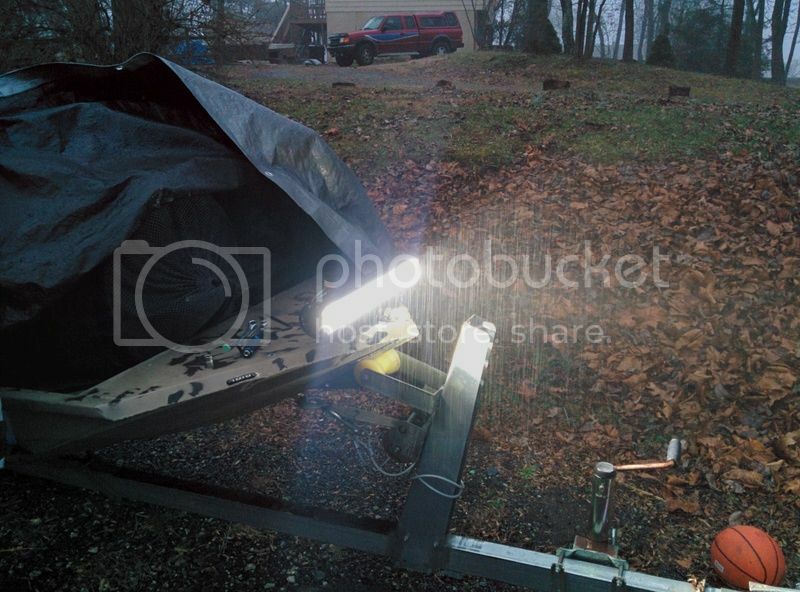 Not my kind of thing, but I did a search for lights on a jon boat (images) and found a couple of interesting ideas. One guy just mounted his lights in milk crates, and they were completely portable. Find a piece of aluminum angle, perhaps 2-3" wide, and long enough to fit between the handles. Fasten it to the flat part of the bow between the handles. Aluminum pop rivets, or aluminum rivnuts will work fine here. Mount it as low as possible, then mount your lights to that. I'd try to get at least .125 aluminum angle, but preferably .250. I have a similar setup to what you are describing, although mine are not mounted under the bow. But this might give you some ideas on some good lights to use. 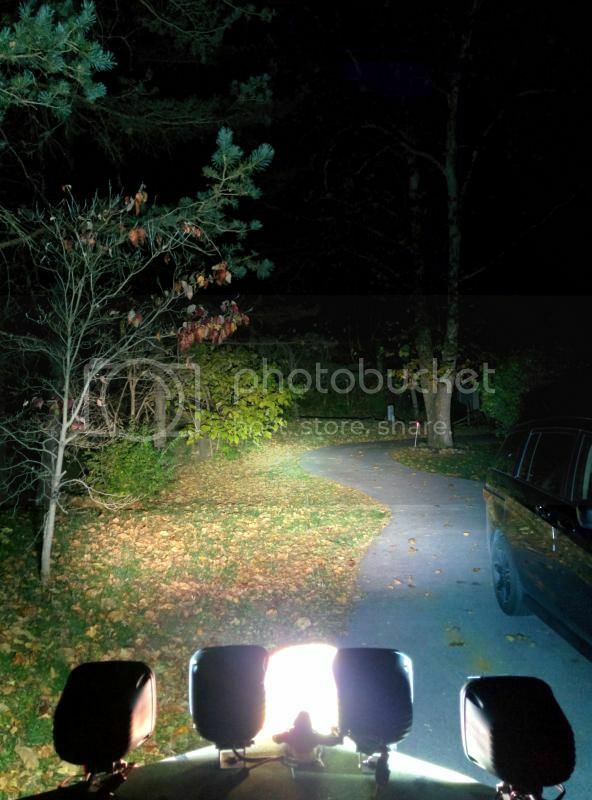 I have this led light bar from Amazon https://www.amazon.com/gp/product/B00KQ ... ge_o01_s00. SUPER bright and at only $36 it's a good deal. I originally had 4 HID's on the bow. 2 started giving me problems, so I ended up getting the light bar and mounting 2 of my HID's off to each side of the light bar. Plenty of light with both on. But honestly, it's probably overkill. The light bar puts out plenty of light. I like having the adjustability of the HID's though. I can adjust them however I need. The light bar only adjusts up and down once mounted and is more of a PITA to adjust then the HID's. Here is the light bar I have. Don't have pictures of it with the HID's mounted as well. Here is when I was running 4 HID's. I moved the outmost 2 a little further port and starboard to make room for the light bar. Extremely bright now with the light bar + 2 HID's running. The HID's I have are Vision X halogen housings that I converted to HID. The beam is a Euro beam pattern. Kind of a cross between a flood and a spot. Works great. Thanks...I like the first pic. That's kind of what I had in mind. I think perhaps I need to first buy the LEDs and take them with me to a shop who can fabricate the brackets so that he can fabricate them to the size of the lights. If you run into any issues mounting them under the bow deck, you could consider fabricating a box to go around the lights on the top deck. I know that's how a lot of duck boats are setup and it seems to protect the lights really well. 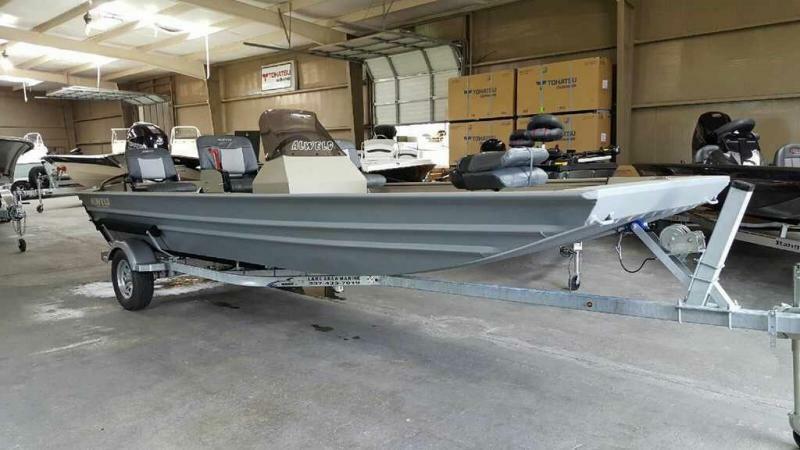 Think that style is popular on duck boats and they call that a duck bill, which is essentially a flat extension of the front with lights fastened underneath. It's typically done on mod v boats but I don't see why it couldn't be done on a flat bottom.